We talk about hockey a lot in my household. I use the hockey metaphors whenever I can to teach Ryan lessons, since it is one of the few subjects that consistently captures his attention. Jaromir Jagr shoots wide. The reason for this photo will become obvious in a few paragraphs. Occasionally I regret this approach, usually when Ryan turns it on me in a way that leaves me shaking my head. Like lots of boys his age, Ryan struggles with his, ahem, accuracy in the bathroom. This has nothing to do with him being on the autism spectrum and everything to do with him being a boy that is always in a hurry. Actually, the sum of my life’s experience in men’s rooms tells me this is a problem my entire gender shares. But, I digress. Since I share a bathroom with the kids, I try to keep it presentable. I spend a lot of time spraying the tile floor (straight vinegar works great) and cleaning up with sanitizing wipes. I had already cleaned the floor once on Sunday morning when I noticed the familiar signs of poor aim. As Ryan happened to be walking by, I stopped him to complain about having just cleaned things. I asked him to be more careful. 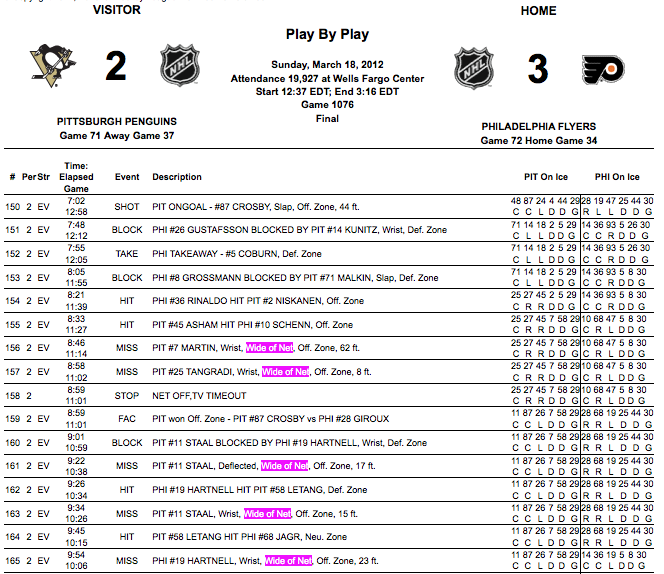 Official play-by-play from a recent NHL game. As the highlighted text shows, players do shoot wide. A lot. Ryan is right again. He walked away, laughing, clearly quite pleased with himself. Veronica and I just looked at each other and started to crack up. “I guess you have tomorrow’s blog post,” she told me. I’ll clean that floor every day if it means I get to share a moment of hilarity and joy with my son. A moment where his wonderful, engaging sense of humor is on full display. Meanwhile, we’ll keep working on the aim — both in hockey and in life. 1) 0.9 seconds remaining when they scored that goal, and THAT’S the example you used? You knew I was reading this, didn’t you? 2) As long as he’s not getting “redirects” or “off the post” you’re probably okay. 1) 11 straight Ws. You have nothing to complain about. 2) I think he’s trying to pick the corners. With mixed results. At least the other child doesn’t have this problem. And you do have to admit that is soooo funny!